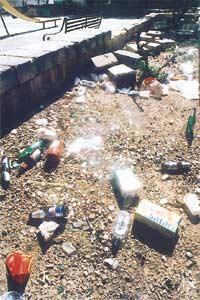 At night, the playground next to Palazzo Spinola is frequented by young people, who leave a mess behind them. The recreational area by Palazzo Spinola, in St Julian's, which in the evenings turns into a popular nightspot, is being upgraded, properly fenced and having closed-circuit television installed, according to St Julian's mayor Peter Bonello. After the weekend, the playground is often a carpet of rubbish dumped by the youths who frequent the spot by night, despite the fact that extra sweeping was introduced. The area is to remain a garden with swings but will undergo refurbishment and the pitch will be properly turfed. The project, which should also include improved lighting, is being designed by Demicoli & Associates for the government, and Spinola Development Company Ltd is contributing, architect Ray Demicoli said. Permits for the works to start were awaited. Complaints have been received about the dismal state of the garden, which is close to five-star developments. Security cameras have already been set up by the Malta Tourism Authority to prevent vandalism in the garden. St Julian's council would like to see the area closed by 9 p.m. but Mr Bonello knows that those who frequent it would just spill out and gather elsewhere - probably on a beach where there would be even less control. The garden is sometimes also cleaned on Sunday mornings but when it is not it cannot be used by families, being lined with broken bottles and the remains of take-aways. Syringes have also been found there and the walls of the palace have been sprayed. Speaking about the state of the area, Mr Bonello stressed the problems Paceville faced as opposed to other localities, having to deal with the numerous hotels that have mushroomed over the last few years. Moreover, the council's budget was based on the number of residents, around 6,500, even if at weekends about 80,000 people, including tourists and foreign students, visit the night life there, he said. Unlike other localities, Paceville never slept and was visited both in summer and winter. "St Julian's is a jewel. But, as a result, it has its own problems because everyone visits it." Mr Bonello felt that the council's budget should take into account the hotels, bars and restaurants and the influx of tourists, students and other visitors. It spends Lm27,000 on street sweeping and a further Lm29,500 on refuse collection every year. Mr Bonello said the embellishment works underway in Paceville, including resurfacing of streets, improved lighting and street furniture, would "attract more tourists and be beneficial to the residents too". Once the embellishment project was completed, reserved parking for Paceville residents would be introduced, he said. The council feels the need for a stronger police presence in Paceville, where bad behaviour and reckless driving are rampant. Drivers screech their car tyres, presenting a hazard to pedestrians. Without police patrol, they are not stopped or booked. The council has met the police to discuss increasing their presence in the area, said Mr Bonello, adding that the idea was also to have traffic calming measures in the streets.